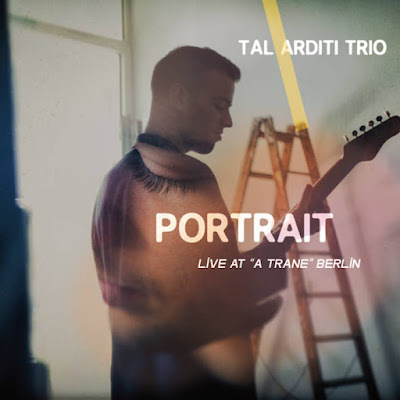 If you love the sound of jazz guitar, this album from young Israeli fretboard wizard Tal Arditi offers up track after track of it. Well-crafted and infused with the influences of playing the Berlin jazz scene for a number of years, it is a fine album, if lacking in anything outstandingly original in terms of tone or approach. Tal Arditi is a new name to this reviewer. Born in 1998, he moved from university in Israel straight to Berlin, where he started playing gigs and festivals regularly and winning prizes, leading up to this point, his debut album Portrait. Recorded with Tobias Backhaus on drums and Andreas Lang on double bass, over eight tracks Arditi demonstrates he’s certainly an important new voice in European guitar jazz, even if that voice still has some maturing to do to become distinctive and mark it out from the myriad other guitar maestros plying their trade. But for a debut, it’s strong and offers some positive moments. Opening track One Step Behind is ambitious – 11 minutes – and opens with a gentle plucked riff that starts to build with the rhythm and bass and as the tune progresses, like a pot coming to the boil, the melody – while simple in structure – is spun and woven by Arditi very well, so that the central spine of the track is always there, but the flourishes work in and out well to create a medium-paced, sprightly opener. His sound is not particularly reminiscent of any particular player – and that’s actually no bad thing – but having said that, there’s also not really a clearly recognisable Arditi sound yet. Second track Berlin Vibe sounds like a cut borne of many nights playing tiny clubs around this great European capital and jazz hothouse. It opens rather maudlin, and stays mid-paced – it never really ‘breaks out’ as such – but some of the chord voicings are rather right angled and unusual in this context, and provide some heft to what is a quite light track. On third track, Sassari, the tempo rises a little, and the tone from the guitar is a little fruitier, but it is essentially more of the same. Fourth track, Waltz No. 1, has the strongest bass showing from Lang, a solo one minute 20 seconds in which has lovely sweeps up and down the fingerboard and some low punch, over which Arditi picks out momentarily the opening chord motif from the James Bond movies, giving it a touch of the Cold War sensibilities. Sixth track My Dream is ballad-ish to start, with stop-start rhythms from Backhaus which aren’t over complicated, but serve to bring the track up a little and really catch the ear. The best track is the last, a live cut, Circles, which starts of with fast-paced drums signalling intent, and lovely arpeggiated chords in the high register, it is well-rounded (see what I did there?) and technically tough, indicating that Arditi, for one so young, already has at his disposal every sort of jazz guitar chop he will need to succeed in a crowded market. That said, overall, the album is maybe let down a little by its lack of distinctiveness – and perhaps that’s forgivable; it’s a debut after all. There’s certainly oodles of promise in Arditi’s playing, but making the shift from jazz guitarist to notable jazz star will likely require a step up in composition and overall sound. Perhaps that will come with album number two.